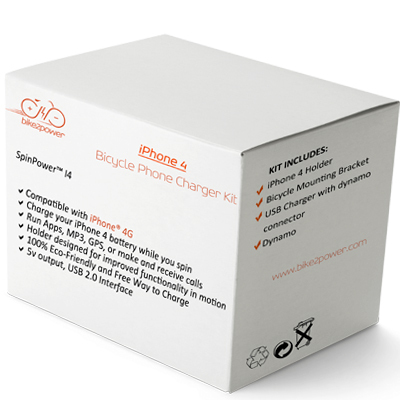 The SpinPOWER I4 is a dynamo charger kit for the iPhone 4 allowing you to power your phone from an eco-friendly power source. The charger makes use of the kinetic energy of the bike moving, its wheels turning, by converting it into electricity that it can then use to power your iPhone 4. The SpinPOWER I4 provides you with the freedom to use your iPhone 4 (and other similar portable electronic devices) whilst you cycle without fear of draining the battery. It can also provide charge for the phone throughout the day, allowing you to provide your phone with more eco-friendly electricity. 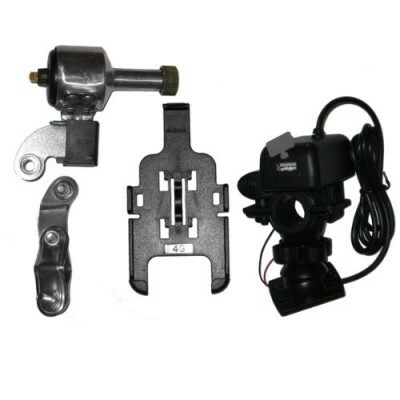 The charger kit provides you with all the components you require (bicycle USB charger, dynamo power generator, iPhone 4 bicycle holder, and all required mounting brackets) along with detailed instructions, helping you to install the charger quickly and easily to any bike. This iPhone 4 Bicycle Charger makes use of a dynamo, to turn your pedal power into electricity to charge your phone with. This allows you to listen to music as you ride, run apps, have phone calls and whatever else you wish to do with your phone all without worry over draining the battery. Alternatively you can use the time you cycle to charge the phone, helping to free you from dependence on mains electricity. The charger can start providing you with electricity from even slow cycle speeds, from as little as 4 mph it will start to power your phone. The SpinPOWERI4 is a lightweight, reliable charger, designed for use with an iPhone 4. By making use of your own energy cycling, the charger allows you to power your phone in an eco-friendly way that does not require you to remember to place something in the sun, or mean you are dependent on winding up a device. It makes use of movement you are already making, helping you make full use of your phone while out on short rides, long rides, or even when away camping. The SpinPOWERI4 charging kit is just $79.99 from Amazon.com. Thank you for reviewing this product. It is an awesome product – I use it myself and so does my husband. Actually, we got it because we were inspired by another article on Envirogadget about a Nokia charger. Thank you for seeking out and promoting eco-friendly (and cool!) gadgets such as this!